I became a veterinary radiation oncologist because I’m somewhat of a techno-geek that enjoys physics and likes the latest and greatest technology. To give you an example, I’m thinking about getting a GPS tracking device that can tell me how far I’ve hit my golf ball into the desert. I can’t help it; I like technology. As a veterinarian, the ability to use technology to provide radiation treatments that allow me to zap tumors and cure cancer is my idea of a hole in one. 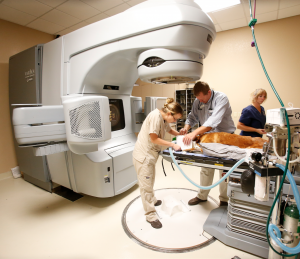 As happy as I was using traditional radiation therapy to help my patients, treating pets with the new Varian Trilogy Linear Accelerator is an amazing advancement in veterinary technology. PetCure Oncology at Arizona Veterinary Oncology is the first veterinary site in North America to have the ability to treat patients with Varian’s RapidArc technology. During treatment the machine moves around the patient, changing both the speed and the shape of the radiation beam to account for both the contour of the cancerous tumor and nearby healthy tissue. On top of that, the dose rate varies as well. The computer that runs all of this would make die-hard PC gamers jealous. All of this technology allows me to ‘paint’ the radiation dose on the tumor while essentially avoiding the normal tissue. For my pet patients, this results in far fewer side effects and allows me to treat in just a fraction of the time (1 – 3 treatments vs. 15 – 30 treatments). The goal is to cure the cancer and I know that by treating in 1 – 3 shorter sessions it’s safer for my patients. During the first month of use, I have been able to treat tumors and microscopic tumor beds that I would never have been able to treat before. 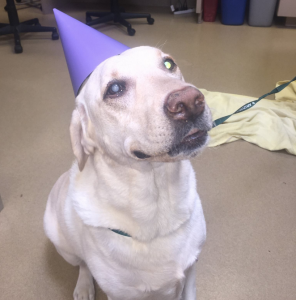 This makes me think of Goldie, a Yellow Lab that we recently treated with stereotactic radiosurgery (SRS) to try and get her recurrent nasal tumor under control. 13 months earlier Goldie has been treated with 18 traditional radiation treatments. After that treatment episode she had blisters on her face and her mouth that lasted a few weeks. This time we treated Goldie with just 3 SRS treatments; she had NO side effects. Another patient, Sadie, had a tumor in the middle of her brain. The neurologists put shunts from her brain to her abdomen to drain the fluid just to keep her alive long enough for us to perform her treatment. She received SRS treatment and 5 weeks later is looking great! And don’t even get me started on how excited I was to be able to tell Dakota’s parents that we could treat the very large lymph nodes inside her abdomen, something we never could have attempted with conventional radiation. As any proud new parent, I love to talk about this revolutionary treatment option in veterinary cancer. If you have questions on how PetCure Oncology at Arizona Veterinary Oncology can help your pet, please give us a call at 480-327-6690.